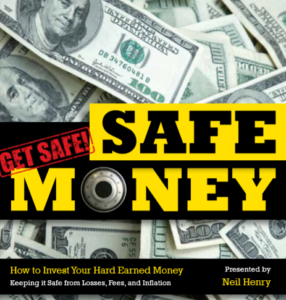 Longtime Charleston area radio host, Neil Henry shares his ideas on a no-nonsense approach to retirement with his book: Safe Money. Neil examines bank savings plans, US Treasury options, and insurance avenues along with long term protection against market risk and inflation. He also offers critical tips for investing and how to avoid or lower the fees charged by brokers and banks that can REDUCE your retirement savings. Learn more about Neil and his approach to keeping your money safe and secure. Would you like a FREE complimentary copy of Neil’s book? Simply call or email.